We live in truly remarkably times. Just fifteen years ago, the thought of promoting and marketing your business to your chosen audience would have eliminated all but the very wealthy of businesses and would have required investing thousands of pounds and employing an external PR agency - today, we can reach out the the whole of the business world in seconds, do it for free and all we need is a smart phone. Yet whilst this opportunity exists, why do only the few in the Sales Profession, take ... See More advantage of growing a 'personal brand' and filling their sales pipeline this way? Today's guest is Chris Reeve. He's works for a Digital Marketing agency and demonstrates many of the qualities that the 'new sales professional' could and should have. Chris believes that there is no longer the option to ‘opt out’ of self-promotion if you truly want to trade in today’s digital business world and attract customers as the 'go to' person in your industry. In this podcast episode, we hear how Chris has built a personal brand on-line by mastering the digital and social assets. Chris is the co-host of a the 'Talk Norwich City podcast' which has over 13,000 subscribers and continues to grow a community of followers on Instagram, LinkedIn and Twitter too - using all of these platforms as tools in his sales strategy. You’ll hear how Chris truly believes that the approach of 'Edutaining' his audience by combining education and entertainment, has become the lifeblood of his business and he shares what he believes are the force-multipliers that create engagement and build ‘brand you’. 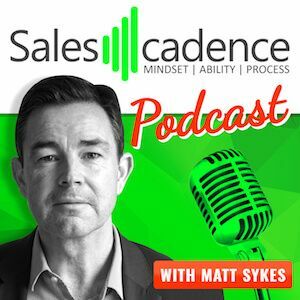 This is a fascinating interview with a highly engaging sales professional who has really mastered the science behind growing an on-line presence and building a personal brand.